GIFTS FOR MEN: GIFTS FOR THE NEW DAD | muted. If you know a new dad, then you know someone who is probably a little stressed out. Make his day by giving something he’ll really appreciate. Below we’ve listed some gift baskets for new dads, some funny gifts for new dads, and even new dad survival kits. Whatever you’re looking for we’ve got something for you. 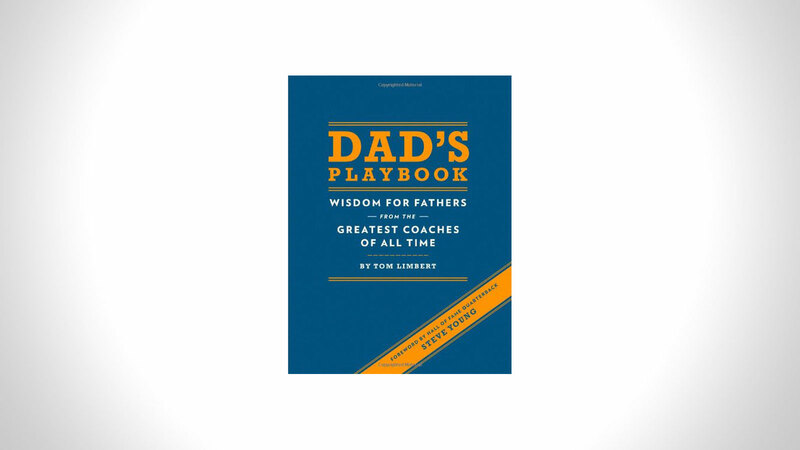 The Dad’s Playbook: Wisdom for Fathers from the Greatest Coaches of All Time ($6) is the perfect gift book for new dads. It is a collection of more than 100 quotes from the greatest coaches of all time. Why coaches? Because they do exactly what dads do: they motivate, mentor, discipline, and love. Some of the coaches in the book include John Madden, Vince Lombardi, Tommy Lasorda, Phil Jackson, and many more. The forward was written by Steve Young. There is a wealth of information and inspiration in the Dad’s Playbook for all dads. New Dad Gift Basket. 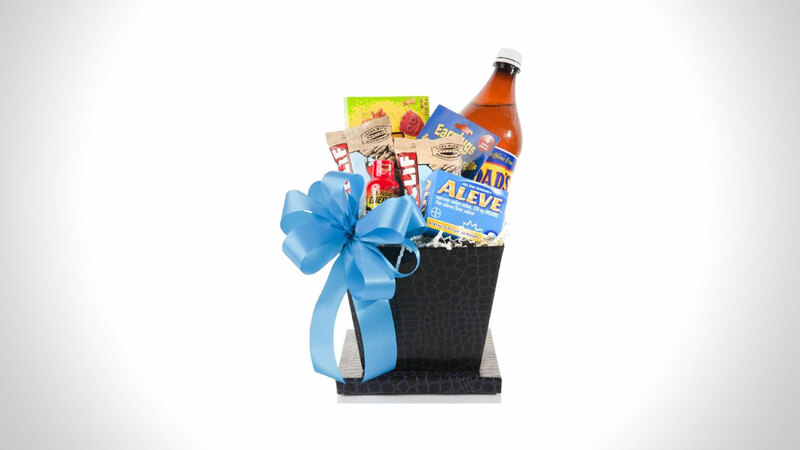 The New Dad’s Survival Kit Gourmet Gift Basket ($33) is perfect for the new dad in your life. Say “congratulations” and help wake up this sleep deprived man with this thoughtful and unique gift. The New Dad’s survival kit is filled with enough snacks and treats to share! No miniature products hidden in huge packaging. Items included: Black Paperboard Box, Dad’s Root Beer, Foam Earplugs, Pain Medication, Sour Patch Kids, Cry Baby Candy, 5 Hour Energy, and Cliff Bar Energy Bars. The New Dad Survival Kit. Don’t call the New Dad Tactical Bag ($100) a diaper bag. It’s a mobile childcare command center. Run out of the office with this bag over your should and no one will ever know you’re off to change a diaper . Every pocket comes pre-packed so you’re ready to take on fatherhood. The bag comes with a baby owner’s manual that includes great tips on how to troubleshoot your baby’s audio cues, how to install the pacifier, and how to swaddle a baby. Of course, you’ll need a ton of energy so the bag also comes with lots of high-energy snacks to keep you at peak performance. 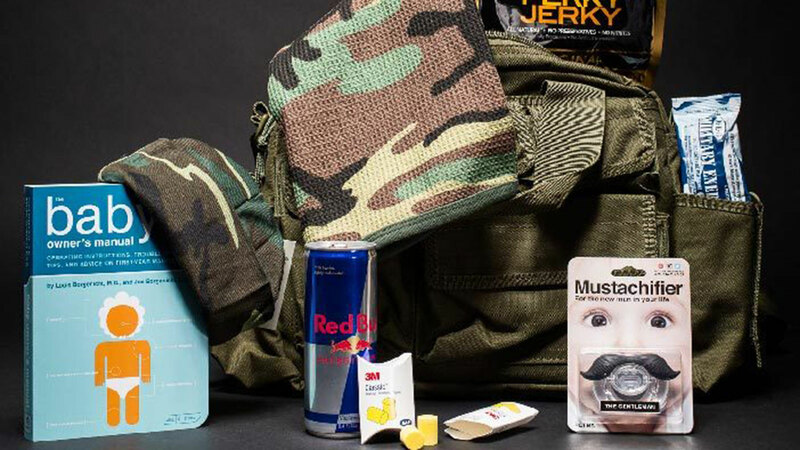 Some goodies include infused Perky Jerky, RedBull energy drinks, no-BS military grade caffeinated energy gum, and two sets of earplugs just in case all else fails. Just because your friend or family member is a new dad, it doesn’t mean they have to loose their masculinity. 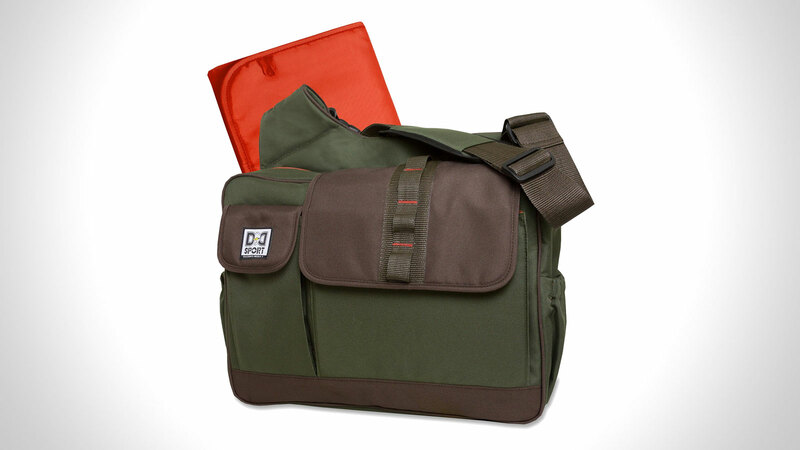 The His Dudeness Diaper Bag ($35) was designed by Chris Pegula and he had the modern dad in mind when he created it. The bag features a messenger-style strap to hold all the babies essentials in style. Additional features include a rough and ready fabric in a great shade of olive, with a burnt ochre lining, cell phone pocket, padded tablet pocket, a handy checklist on inside flap, stroller attachment clips, and multiple interior and exterior pockets. Funny New Dad Gift. The name pretty much says it all. Every new dad will eventually have to go to the last resort in order to get a little piece and quiet. The Mute Button Pacifier ($10) is that last resort. This pacifier is German made and is made from non-toxic, hygienically formed, natural bit-resistant materials designed to form naturally in the mouth. The Mute Button Pacifier satisfies the babies need for supplemental sucking giving the old man much needed quiet. The pacifier is the perfect size for babies 6-18 months.